Every weekend we dig into the archives. This post by Matt was originally published in May 2016. Yesterday Phil Twyford announced that it would be Labour’s policy to abolish Auckland’s Rural Urban Boundary (RUB), as part of a policy to improve housing affordability. Labour wants the Government to abolish Auckland’s city limits to get people out of cars, caravans, garages and tents. Labour housing spokesman Phil Twyford said the urban growth boundary had to go because it has fuelled the housing crisis and people would not be forced into bad circumstances if the Government acted. “The Government should rule out any possibility of an urban growth boundary in Auckland Council’s Unitary Plan if it is serious about fixing the housing crisis,” Twyford said. “Over 25 years the urban growth boundary hasn’t prevented sprawl, but it has helped drive land and housing costs through the roof. It has contributed to a housing crisis that has allowed speculators to feast off the misery of Generation Rent, and forced thousands of families to live in garages and campgrounds,” Twyford said. There’s no doubt Auckland has a housing crisis at the moment, with house prices increasingly dramatically over the past five years. Rents rose more slowly but the impacts for some families are still alarming. There’s also no doubt that planning restrictions have played their part in creating this crisis – by making it too difficult to build the required number of houses that Auckland has needed. Addressing regional scale issues like housing and transport was one of the key reasons Auckland Council was amalgamated in the first place and why one of its first tasks was to rewrite the city’s planning rulebook through the Unitary Plan. It’s also important to recognise that the RUB doesn’t exist yet as it’s part of the Unitary Plan being decided by the Independent Hearings Panel. It’s quite a different tool to the old metropolitan urban limit (MUL) that was typically set up against the edge of the existing urban area and made any urban expansion a significant challenge. The main argument against the RUB is that it creates a scarcity of land where urbanisation is possible, which drives up the price of that land. Over time the high price of land translates into higher house prices and reduced affordability. Fair enough. But what can we actually do about that? 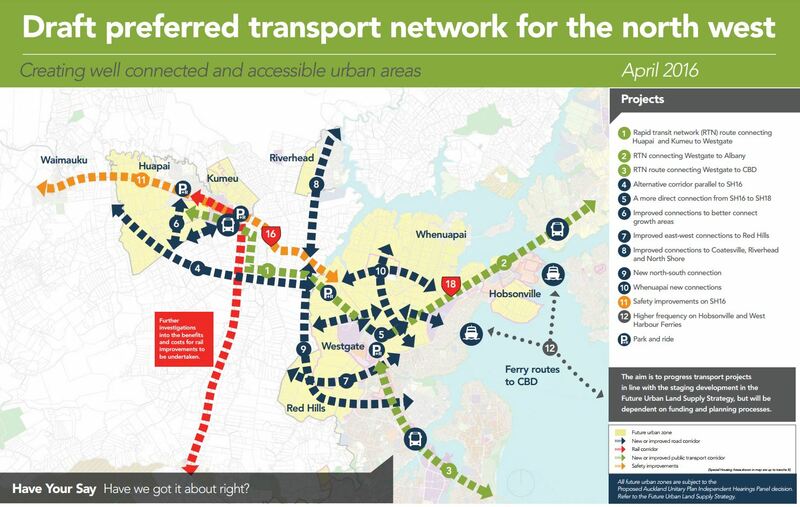 As Auckland Transport’s consultation video above shows, the RUB isn’t simply a line on a map: it’s a plan to provide publicly-funded infrastructure to new urban areas. If you wanted to expand the yellow future urban zoned areas on the map, you’d also have to find the money for additional infrastructure. In other words, greenfield land is in scarce supply because it’s currently farmland that requires roads, pipes, train stations, parks, schools, hospitals and a myriad of other infrastructure investment to take place before development can actually happen. Making a dent in the housing shortfall by enabling more urban expansion to occur is therefore entirely about speeding up infrastructure, rather than whether or not there is a line on a map. As we’ve talked about before, the costs of supplying bulk infrastructure to greenfield areas are large. It is time-consuming to investigate, design, consent and build these projects. There’s no quick and cheap way to make a whole heap more greenfield land “development ready”. In fact, removing the RUB could easily disrupt existing infrastructure plans and slow down overall development. If you take a look at the work that’s been done on transport for future urban growth, the networks are optimised around the location of the RUB. Scattering small developments around the region could force AT and NZTA to react to piecemeal development rather than taking a more strategic approach to infrastructure development. I suspect that the first thing to get cut due to funding pressure would be the city’s rapid transit plans, which have already been delayed long enough. This would have the perverse effect of putting a damper on the 60-70% of development that’s intended to occur within the existing urban area. In short, abolishing the RUB isn’t a straightforward proposition. It’s not actually obvious that you could abolish it, as infrastructure plans would simply turn into a de facto RUB. Let’s unpack this. First, he says that he’d like to see “intensive spatial planning of Auckland’s growth areas” with “future networks mapped for transport and other infrastructure”. That sounds a lot like the process that Auckland Council and Auckland Transport are currently undergoing for the yellow-coloured future urban land. Second, he says that “land of special value can be set aside, like the northern coastal strip or Pukekohe’s horticulture soils”. That sounds a lot like some sort of boundary between urban land and non-urban land, which is exactly what the RUB is intended to be. Basically, if you read beyond the headline soundbite, Twyford’s policy starts to sound a lot like Auckland Council’s current policy, just under a different name. That shouldn’t be a surprise. After all, the current government has been looking at this issue for half a decade now, and they’re pretty critical of restrictions on land supply. If it was a simple matter to abolish the RUB, they probably would have done it by now. There aren’t necessarily any “magic bullet” solutions to land supply. Greenfield land needs infrastructure to be useful, and infrastructure is expensive and slow to build. Shifting some of those costs onto developers, either through development contributions, targeted rates, or design rules that reduce the need for hard infrastructure (e.g. stormwater pipes) can allow more of it to happen. But the problem is that the developers push back, which limits the gains that can be had in this area. Freeing up growth on the fringes needs to go hand in hand with allowing more density – so people can build flats and apartments in parts of the city where people want to live, particularly around town centres and transport routes. That’s a great aspiration, but to be useful it needs to be backed up by specific policies to limit the use of height limits and other density-killing rules like minimum parking requirements. For example, would Labour lift building height limits throughout the urban area? If so, how high? Lifting building height limits and density controls would have some immediate benefits for housing supply. For one thing, the transport networks and water pipes have mostly already been built, meaning that there’s no lag time waiting for the infrastructure providers. For another, it would make the housing market a hell of a lot more competitive by opening up lots of new development opportunities in the places that people most want to be. This trend is repeated around the world, with more spread out cities requiring a greater amount of travel and, consequently, a higher proportion of income being spent on transport. In some cases this can end up outweighing any savings in housing costs. If we’re going to lift restrictions on housing construction, it makes sense to prioritise lifting the ones that also pose a barrier to efficient travel patterns. The RUB is a bit easier to work with than the previous Metropolitan Urban Limits (MUL) was. The ARC tried to use the MUL as a means of forcing intensification as they seemed to believe that brownfields land or even intensification of existing residential was a perfect substitute for greenfields housing. But is simply isn’t. Despite their spin, intensification requires major upgrades to pipes, and the water and sewage has to go further. Greenfields comes with new roads while intensification can avoid that cost but also misses out on the benefits. The RUB can change provided effects are mitigated. The MUL was totally at the discretion of the ARC and they were blind to any reason. And when the greenfields pipes need upgrading, we’ll be long gone, eh? What a lot of infrastructure we’re leaving the future generations, when we should be maintaining and upgrading what we’ve got in order to leave the smallest footprint. Perhaps you should tell AT and Auckland Council planners about leaving the smallest footprint. I have just read a report for Watercare where they are only planning for a yield of 15 homes per hectare in a greenfields area. Probably due to all the demands made by the various bits of the Council for lots of wide roads, collectors roads that can’t have access so the house ends up with a street front and back, swales, stormwater ponds, and all the other needless nonsense that the Council asks for because it is ‘free’ to them. I suspect it is just a different way of preventing greenfields, make the costs so high and the yield so low that people give up. Can you link the report, miffy? I was sat here thinking ‘1 home per 65m2 seems reasonable’, then I realized that you said 15 per hectare, not 150. That’s a ridiculously low number. There seems to be a huge irony here. What they really mean is that they hope to get people out of stationary cars into moving cars. Planners should get out of trying to plan urban growth – all we have ended up with is regional plans and district plans across 70 odd territorial authorities full of arbitrary rules (with no individual regulatory impact assessments) stacked as high as Skytower and billions of manhours spent developing and defending them. Remove the RUB, remove the zoning and density rules and implement the RMA on a robust (nationwide) effects basis as it was originally intended. We have a carbon tax on fuel already. It will move with the carbon price. That said, private travel is otherwise underpriced. Add congestion tolls and remove the ratepayer subsidy. Yes you are right that private travel is underpriced. You call the solution a congestion tax. I think that the answer is just a road toll. It seems reasonable that if you choose to drive 20, 40 or 60 kms across Auckland, for whatever reason, then you should pay the cost. It is unreasonable that the rest of the community subsidise an environmental and economic folly. We already pay a road toll in a way which is the fuel excise tax. If we had an elastic land use system with no density controls fewer people would have to travel 20-60 kms across town. Remember that travel is only a derived demand on the spatial land use allocation. My point is that the subsidy to commuter travel works against any chance that removing zoning regulations will move us to a city of good urban form. Auckland also has too much low density and ill-used land to justify ruining more farmland. That’s not going to be fixed by removing the RUB. And yes, that land matters. Agreed – subsidies on commuter travel should be removed. If there were no density controls, the marginal costs of building upwards somewhere would match the marginal costs of greenfield expansion. Remove the density controls and we would have a lot more of the former first before the costs matched. 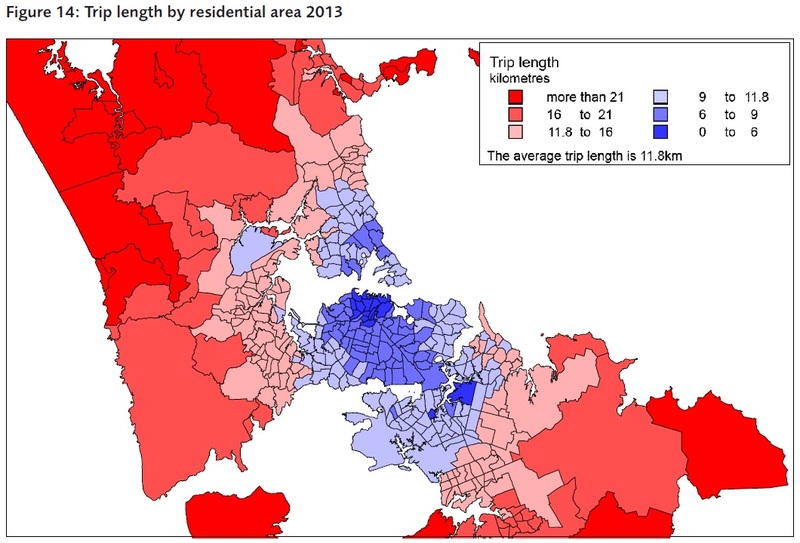 Auckland is already a basket case after years of short term bad urban and transport planning. Auckland’s needs to stop sprawling by using both the RUB and unity plan to use existing un-utilized land within the RUB boundary. There is no reason for the Ministry of Housing and Urban Development and AC to use the powers under the Part 2 of the Public Works Act to force land bankers to sell their land for new land effective housing development.